These instructions are for manually uninstalling IntenseDebate for Blogger Template installs only! We have received reports of users encountering issues when uninstalling IntenseDebate from their Blogger template (for Template installs, not Widget installs). If you encounter the following error message in Blogger after uninstalling IntenseDebate, please read on for instructions on how to manually uninstall. These instructions may seem daunting, but don’t worry, they are exceptionally detailed so everyone can successfully uninstall IntenseDebate. You might even learn a thing or two about editing your Blogger template. Sign-in to your Blogger account. From your Blogger dashboard select the Design tab, followed by the Edit HTML tab. Make sure you backup your template and save a copy of it on your desktop, just in case you need to revert and undo your changes. Select Download Full Template. Your template file will be named something along the lines of “template-38016866276773####.xml” (the number will be unique to your template). Notice the “.xml” file type – make sure you maintain that extension throughout this process. Learn more about XML. Now you will need to open your template file using a program that can handle .xml files. Do not use Word or Pages to open this file, as it will garble the file contents. You need to use a text editing program like: NotePad (for PC users), TextEdit (for Mac users), or Komodo Edit (a free, open source, text editor available for both PC and Mac users). You will want to rename the file to be something like “template-modified.xml”, so that you have a copy of the original file. To do this, select File > Save As > and save it as “template-modified.xml”. Make sure you maintain the .xml file type. Next you will need to locate the IntenseDebate code using the “Find” function. On your keyboard press CTRL+F (for PC) or Command+F (for Mac). That will bring up a search bar to help you easily locate the IntenseDebate code in your template. 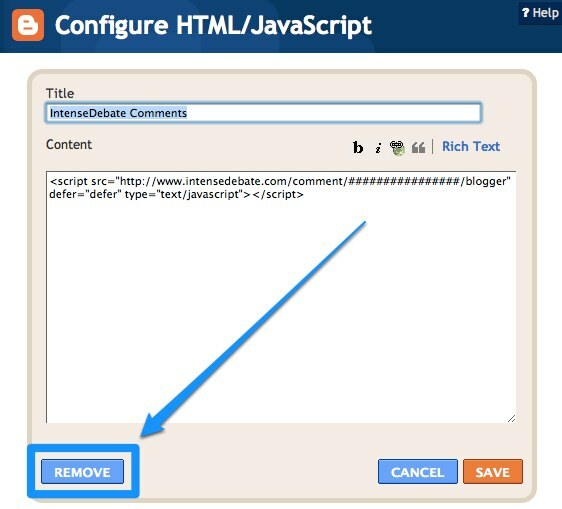 The first tag, <!- -IntenseDebate – ->, indicates the start of the IntenseDebate code, while the second tag <!–/Intense Debate–> indicates the end of the code. Everything in between those two tags is the IntenseDebate code. Remove all of the code in between the <!–Intense Debate–> and <!–/Intense Debate–> tags (including the tags). Save the file as “template-modified-2.xml” to your desktop. 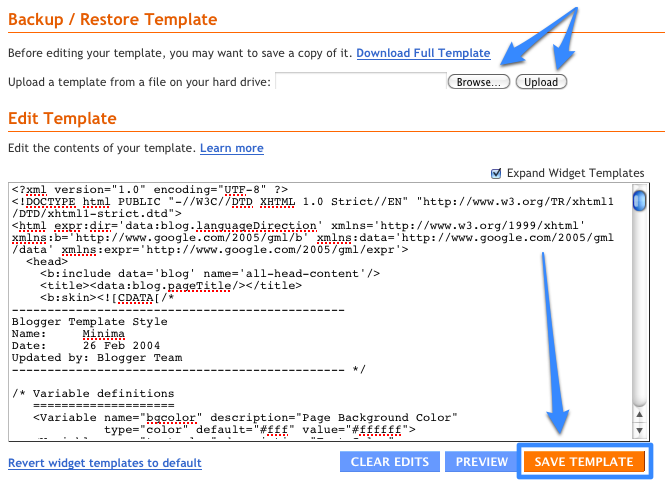 Now it’s time to upload your modified template to your Blogger blog. In your Blogger admin panel, go back to the Design tab and select Edit HTML. Locate the file uploader under the Backup / Restore Template header. Select Browse and locate your “template-modified-2.xml” file (which you saved to your desktop), and select Open. Select the Save Template button, and you’re done! The following instructions are for the updated Blogger interface. If you are using the old Blogger interface, please switch over to the new interface temporarily. You can do that by selecting the “Try the updated Blogger interface” link at the top of your Blogger dashboard. Tags: blogger, uninstall, XML — Can't find your answer here? Let us know.